of course doing sterling service once again to entice visitors inside! Inside the church Bruce Douglas continued his tradition of decorating the walls with a magnificent display of Meccano literature (displayed as the background image to this webpage - ed.). Sadly this will probably be for the last time as Bruce is soon to depart the mainland shores to take up residence in Tasmania. On this occasion rather than keeping to a particular theme Bruce presented a range of items � foreign language magazines and manuals, American MM�s from 1918-26 plus a whole lot of other MM�s, manuals and ephemera. Overall it was an attractive, colourful and interesting arrangement. made using Roger�s re-furbished parts and all looked very smart. 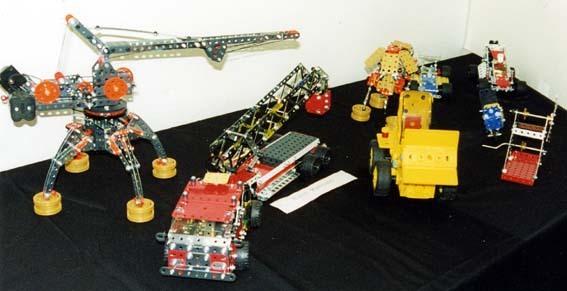 In addition he has a selection of models from the Single Model Sets of 1996 and three models from sets of the 21st century. 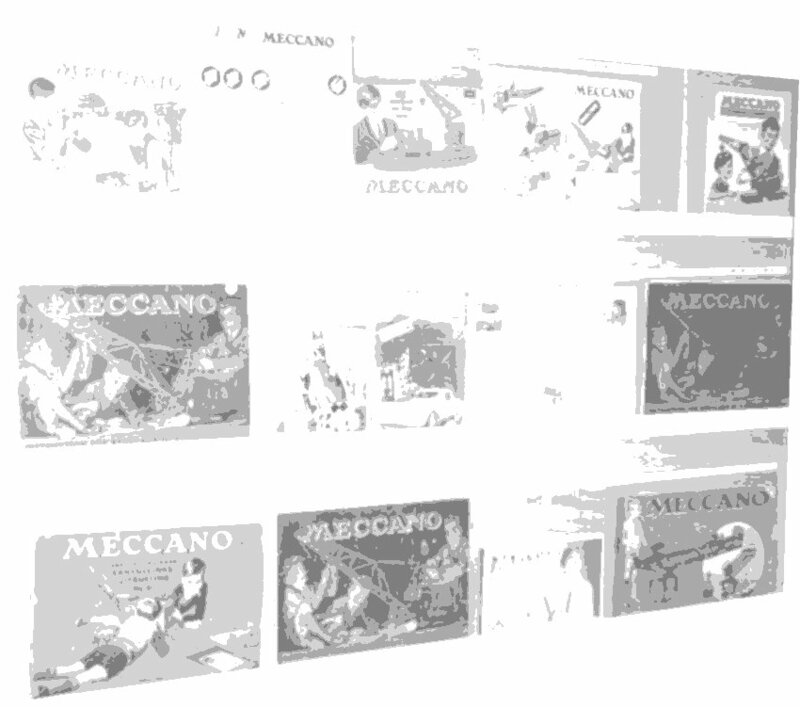 models from Junior Meccano (plastic parts) sets. Light Aircraft from the Special Anniversary Set. 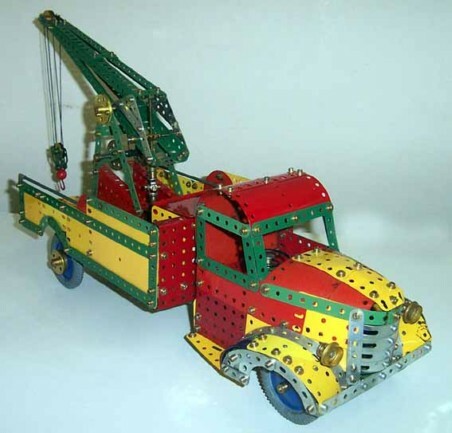 Chris Comer�s first model for the 2003 Exhibition was a Fork Lift Truck from the manual of the 1970�s No 7 set in red/yellow/zinc with modifications to the roof to minimise bending of parts! His other models were the Snowmobile from the Multimodel 20 set and the Helicopter from the 2003 Design 2 set (again modified to avoid bending narrow strips). Paul Johnstone produced his usual fine collection of models which included two new models. Breakdown Lorry (Model No 8.6) from the No 8 red/green set of 1957 constructed using a mixture of red/green and yellow/zinc parts. Coxless Pair from the No 7 manual of the 1970s. 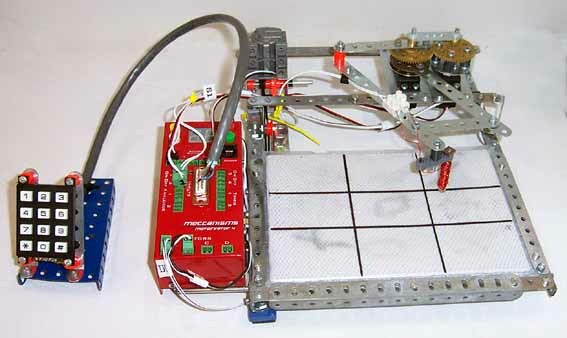 Paul first demonstrated this model as a �push along� device at our Meeting in February 2003 but he has now motorised it. In addition Paul displayed several models that he has shown at previous exhibitions but which still provoke much interest. Titanic � a freelance model at 1:200 scale based on original blueprints in 1960s red/green, now fitted with electric light. Tri-engine Bi-Plane (Argosy) of 1928 (SML 34) again in red/green � a magnificent model. Mobile Workshop � Model No 10.9 from the 1937 No 10 Manual. 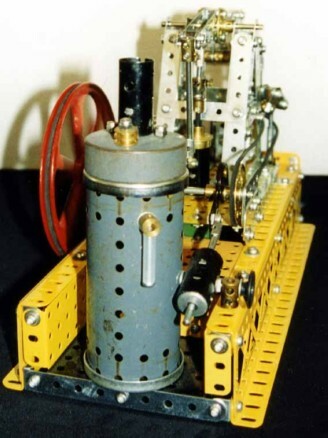 Single Cylinder Horizontal Steam Engine (SML 11) which Paul has converted to a �hands-on� model operated by a crank handle. Showman�s Traction Engine in dark blue/yellow of 1978 which was shown on the cover of the MM of Dec 1970.
red/green based on drawings of a 1996 Benetton. 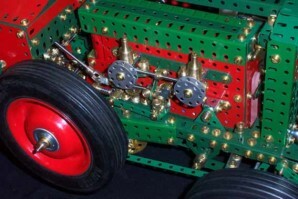 Tony Press brought along a fascinating array of items including a collection of Meccano electric side-plate motors � 10 in all � covering the years from 1915 the 1960s. 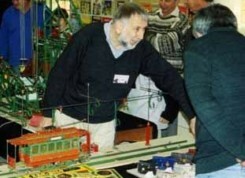 Tony also exhibited a No 6 Meccano Set from the early 1950s alongside a No 6 Ezy-Bilt set from the mid 1960s. 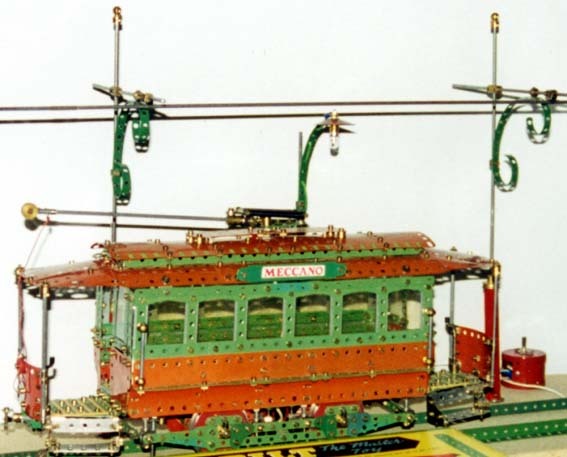 In addition Tony had his model of an early 20th century Sydney Tram which moved along its own track (Meccano of course!) at a very smart pace. I don�t know if the prototypes were as nippy but if so they would have provided an exciting ride! and discharged into the ship�s bunkers.) 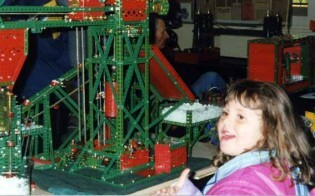 Graeme had automated the model using small pieces of plastic foam to simulate coal. Instead of discharging into a railway truck the �coal� finished up in a hopper from where it was picked up by a bucket conveyor to return it to the original supply point, thus allowing continuous operation of the model. The adjustments that Graeme had made to the operating mechanism were impeccable and the model ran faultlessly throughout the two days of the exhibition (or so it seemed to me). 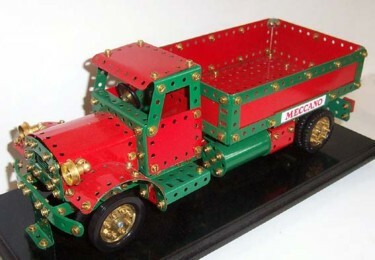 It�s the kind of model that you can sit and watch for hours and must be one of the best of the �older style� Meccano models. made of sprocket chain. Assembly of such a small model is extremely fiddly! Dockside Crane - from the No 6 manual of the early 1960s using original bright red and green parts. 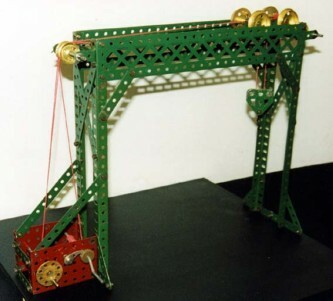 It features luffing and hoisting controlled by cranks in the cabin, swivelling of the boom controlled by wheel in tower and a right angle drive using Meccano tyres. 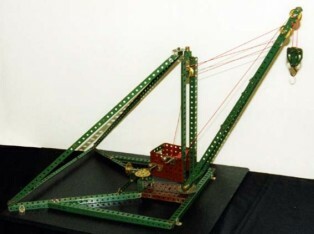 It was a popular style of a crane used before containers took over in shipping. 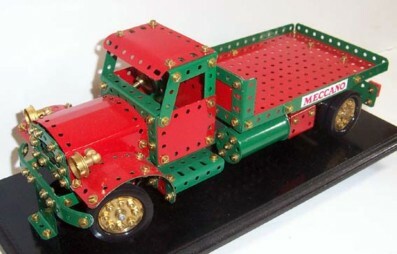 Eight-Wheeler Lorry - from the No 8 instruction manual of the mid 1950s in red/green parts of the period. It had dual front axles with steering controlled from the cabin and chains along the loading platform. One of those models every boy wanted to build, if only he had the parts! Fishplate Sonata - from the No 9 instruction manual of the 1950s made from restored and repainted parts and features a painting of a fishplate motif on the wall. A motor drives two eccentrics under the stage which control the performers by cords. Both performers play only in the staccato style! Harley Davidson Motorcycle - built from Steel Tec, a modern copy of Meccano made by Remco. 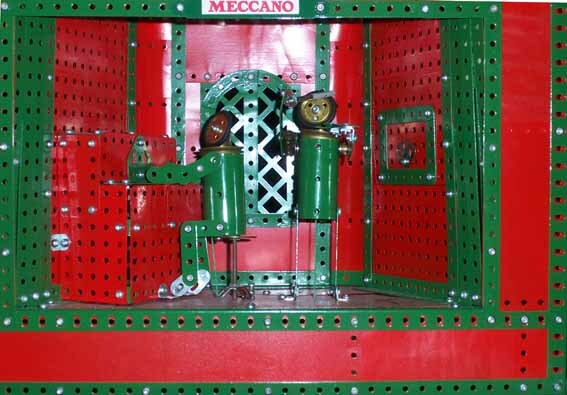 Steel Tec metal parts are fully compatible with the Meccano system. 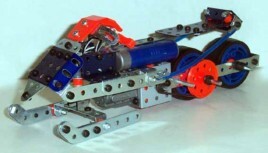 A motor drives the rear wheel via a contrate gear and a driving belt. The model uses a number of "one-use-only" plastic moulded parts. 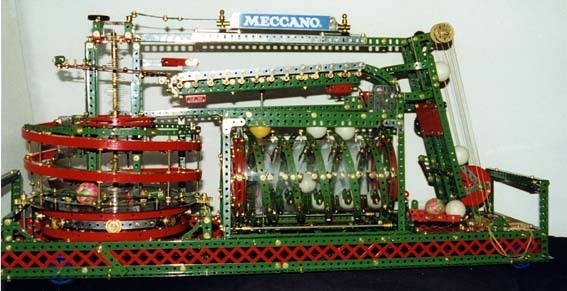 Horizontal Steam Engine - from the No 4 instruction manual of the 1950s constructed using original 1930s green, blue and red parts. Blue plates feature the gold cross hatching of the later 1930s Motor drives crank shaft via drive belt; the crank shaft drives the governor. Dumpmaster - a freelance model restricted by the parts available and using rubbish bin hinges for unloading. 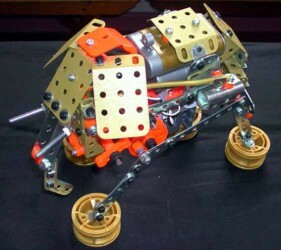 Made from plastic Meccano Junior parts of the 1980s Demonstrates the basic Meccano principles to the youngest enthusiasts. 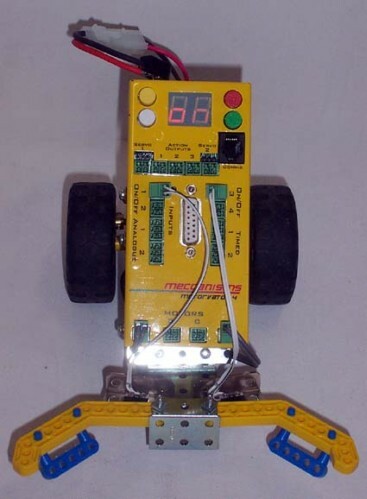 Scraper - a single model Meccano pocket outfit of the 1990s made from original yellow and silver Meccano parts. The vehicle is articulated and steers by adjusting the relative position of the cabin to the trailer. The model features a trailer that loads itself as it scrapes up soil, etc. 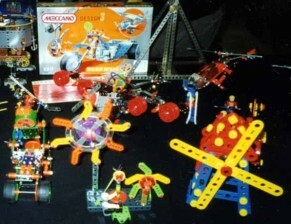 Meccano pocket outfits of the 1990s were designed to build one model only. Tractor And Dumper Wagon - based on a model in No 6 instruction manual of the 1950s using yellow/zinc parts. 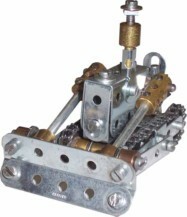 Steering is provided by a direct pin in the slot method and the load can be dumped by opening the bottom of the trailer. the two simulated SU carburetors. The model is powered by an electric motor. So far the model has taken about 10 months to build and John proposes to add several features to complete it � exhaust pipe, mudguards, bonnet, more detail of the engine, rear luggage carrier and possible remote control. It would be nice to see it at next year�s exhibition, John! Barry McDonald once again brought along a fine collection of models. Runcorn Transporter Bridge (which was also on display last year) which Barry modestly describes as a �re-build of the No. 10 manual model of 1937�. In reality Barry completely re-designed the model which features fully automatic reversing of the transport car. The use of braced girders for the span greatly increases the realism of the model as does Barry�s design of the supporting towers which look much more like those of the prototype, the Runcorn Transporter Bridge (demolished 40 years ago). To add realism to the scene Barry had the Dredger from the No 4 manual of 1954 in the background. Generic Transporter Bridge which was originally built by Vic Stanley and this model also had fully automatic operation. This model was not based on any particular bridge and is a very attractive model, though somewhat smaller than Barry�s other transporter. As Barry puts it � �much more user friendly to transport by car�. Trucks � one each from the Army and Highway Mulitkits. Two hands on games from the MM of 1959 - Climbing Monkeys and Strength Skill Machine. 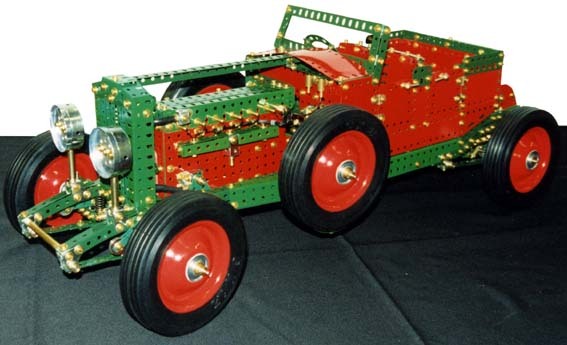 Tractor � from one of the Junior Meccano plastic kits. One display that I suspect many missed was by John Hutchinson. 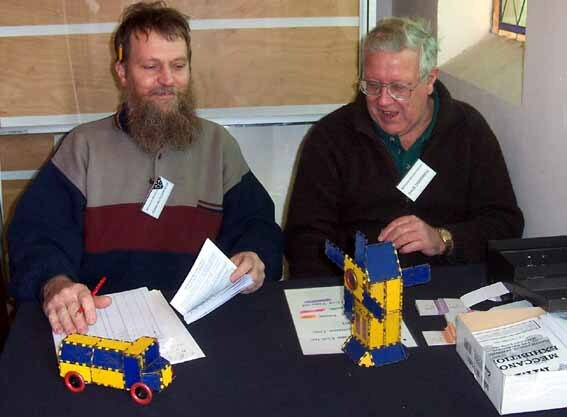 John had not booked a space so rather than be left out he brought along two models from Dinky Builder and displayed them at the entrance while he was on door duty! (See photo.) But you had to be quick � they were only to be seen for one hour. Just the same it seems a nice idea. Perhaps next year we could encourage those on door duty to bring a small model for added interest there! Meanwhile, over in the Alfred Neufeld Hall more models had been set up to provide an equally spectacular display. Upon entering the first display was Mike Maloney�s fine collection of models. Mike�s latest and most impressive (in terms of size, ingenuity and general interest) was a Giant Pontoon Crane built by the Germans during the 2nd World War. 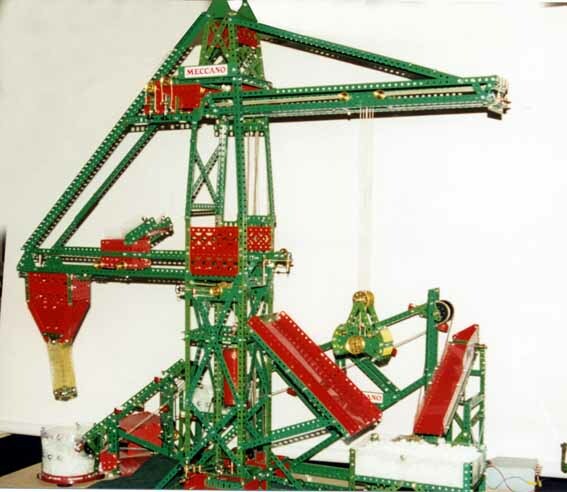 Mike�s model was impressive enough � the boom of the crane measured 1.2 m � but the prototype must have been enormous since Mike was working at a scale of 1:80 (work out the size for yourself!). Mike�s other models also appeared at last year�s exhibition, but it was nice to see them again � they made an interesting and colourful collection. 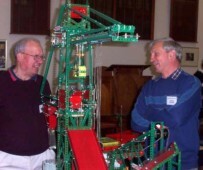 Beam Engine � a Mike Cotterill design. model on display at this Exhibition. Moving along, Peter During was entertaining the visitors with his 4 models. There were two motorised fairground models � an octopus (actually a hexapus!) and a small rotating ride � as well as a box stacking machine (busily stacking match boxes and a small windmill, operated as a hands-on model. As is always the case at our Exhibitions this last model was very popular with the children. one of the models on display there to his own design. wire slopes from left to right, then vice versa and so on. such, perhaps the cyclist is symbolic of a high flyer�. John Phipps is one of the Club�s interstate members � from Tasmania � and braved the crossing of Bass Strait (at 10,000 m) to bring a couple of models to the exhibition. Welcome John, very nice to see you! John had the Swingboats Model No 8.13 from the 1970s manual as well as the Acrobat from the No1 Manual. 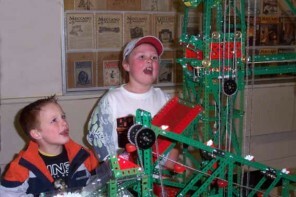 Both of these models were �hands-on� and provided lots of entertainment for the younger visitors. contents of the medium sized sets. Bill Davis clearly likes cranes � particularly those from the Set 4 instruction book of 1930. I think that many of us would share Bill�s interest in such models � they are simple but interesting and have a nostalgic air about them. Last year Bill exhibited the Girder Crane (that featured on the cover of many instruction books of the 1920s and 1930s) and this year had two more examples. � and this appears to be the model�s downfall. This is not the first time I have come across such criticism of model No 10.12. Three years ago at Skegness I met a teenage girl who was having similar problems with the same model. Have any of our members managed to get this model to work properly using solely parts from a No 10 set? Shay Locomotive developed about 120 years ago in the eastern United States by Ephraim Shay for hauling log trains in mountainous country. 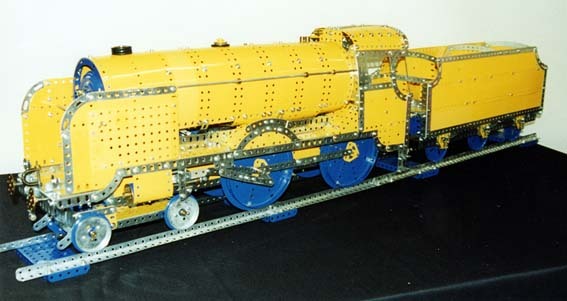 This model was originally built by Mr. R H Groen of Amsterdam Holland in 1966 and was later modified by the South African Charles Roth in 1991 after it which became Modelplan No 97. Jack�s modifications included reworking the chassis changing the boiler (note the Jackano special parts!) and altering the make up of the wheels so they would run truer (no wobblers!!). To power the model Jack has used a new modem sideplate Motor instead of a Decaperm Motor. Heisler Locomotive � again used for logging in mountainous country. The model was first designed and built by Dr. Keith Cameron. 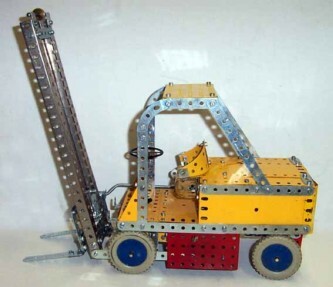 Jack made changes to the to boiler and chassis as well as using larger plates. To add to the interest of his Locomotive display Jack had a recording playing (or something of the sort) of a slowly moving steam locomotive � sounds of letting off steam, bells ringing, directions being shouted, applying power under load etc. etc. This recording was obtained from the Latrobe Valley Model Railway Club Inc. following a display by the MMC there in June. As well as the three locomotives, Jack had five other models on display. Four of these comprised a range of heavy commercial vehicles in Jackano red and green. 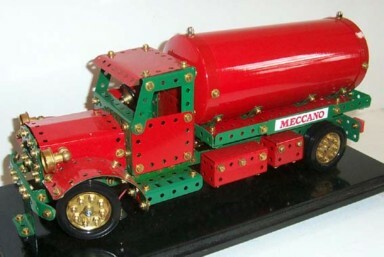 Tip Truck This model was built originally by Bernard P�rier as described in CQ Mar 1997. It is interesting to compare it with Mike Maloney�s version of the same model � the two look quite different! Ready Mixed Concrete Truck using Bernard�s cab and chassis and Jack�s own design for the mixing barrel and mechanism for driving the barrel. Jack�s final model was a military model in Jackano army green this time! 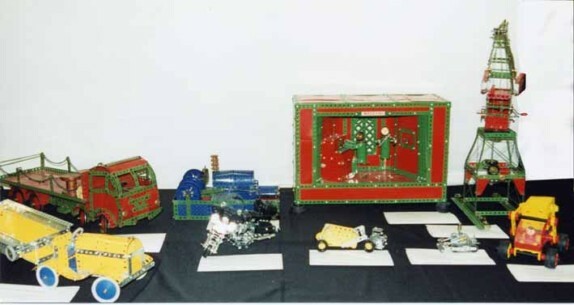 Carol Parsisson provided an interesting display of models from the French Meccano sets of the late 1990s � not a piece of Jackano to be seen! Elephant � from the Motion System 9550 Series. (Bill Inglis called his version of the same model a Mammoth!) It was actually able to walk along on its own four legs, though it was not particularly steady and its gait was �interesting� to say the least! Crane � the flagship model from the Special Edition Anniversary Set 7080. Fireman�s Rescue Truck � from the 7064 Series Set. 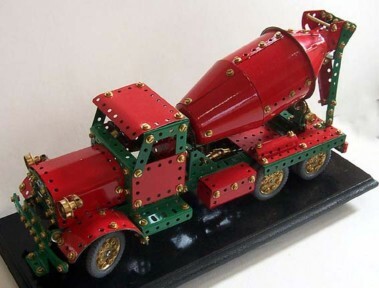 This is a very attractive model � nice colours in zinc, red and black and looks the part too. Dune Buggy � from the 4065 set. Carol also had 3 models from the No. 1 set of the 1970s � Racing Car, Windmill and Scooter. Ball Roller � This is a new ping-pong ball roller, in which portability was important � last year�s ball-roller is just a fraction large, and heavy, for convenient transport. Alan Partridge is presently publishing designs for various ball-rolling units in Constructor Quarterly, and in this model I have used five of the more interesting ones, arranged to include two ascending, one descending and two horizontally transferring units - all are driven from a single motor mounted in the base. Some 14 balls are in circulation, and the time for a ball to complete a full circuit is about one minute. 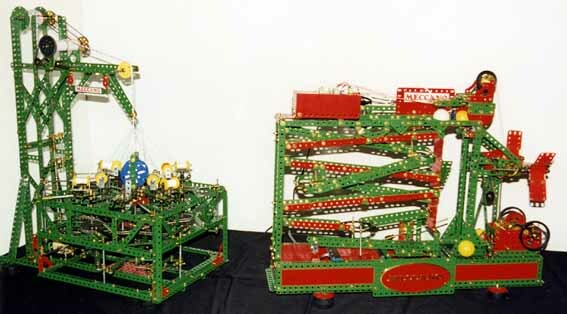 Braiding Machine � This model is based on one published in the Meccano Magazine in 1966. I showed it at our exhibition last year and at several hobby shows in the meantime where it has proven to be a very reliable performer � its action is fascinating to watch. The braid comprises a central core around which are wound eight separate braiding threads arranged in a three-dimensional �plait� � of the spools containing the braiding threads, four rotate clockwise, and four counter-clockwise. The machine produces braided cable at about 9� or 3 m per hour, and uses up thread from each of the eight spools at about 12� or 4 m per hour. Four braiding spools rotate clockwise, and four anticlockwise - and in doing so the spools move in and out around each other exactly in the manner of Maypole dancing. Windmill � This model, outside the front door, is immediately recognisable as representing a typical Australian windmill. Initial problems associated with the overhang of the heavy rotor were solved by adjusting the counterbalancing mass of the windvane as required. 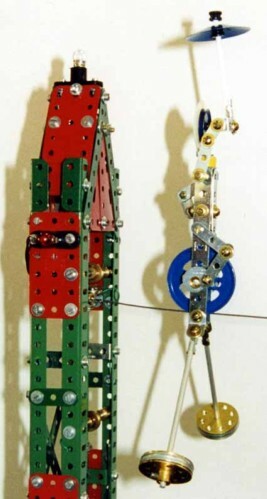 The slowly rotating rotor is driven by Axle Rod running up the centre of the framework from a small motor in the base. simple framework to provide a �skyhook�, and motorised it � a time-delay push-button switch allows sufficient time for him to �climb� to the top, pause there, and then descend again under gravity by back-driving the hoisting mechanism. In addition, it was necessary to provide an air brake to slow his descent � it all adds to the spectacle! A popular model with the small fry. 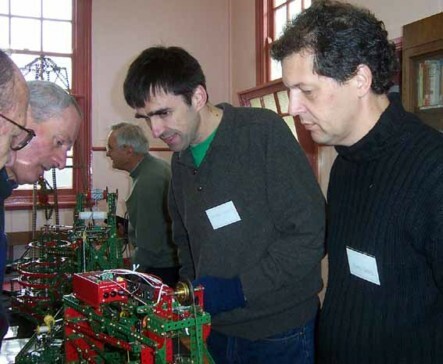 Andrew Wells and Chris Harper were visiting us from New Zealand � nice to see you both � and had 4 models set up to demonstrate their Meccanisms System which includes a programmable electronic controller specially designed for Meccano. 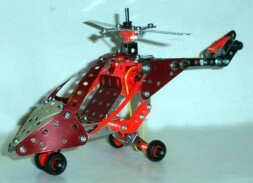 manufacture by Jackano of rare Meccano parts that were needed. Kimball also brought along his Systeme Lartigue monorail steam locomotive �making another appearance after a year�s hard yakka at displays around the State�. This model made its debut at last year�s exhibition and it was good to see it in operation again � a nice model! Patrick Russell-Young brought along his Loom (as usual!) which provided much entertainment for the visitors (as usual!). Patrick also has his Novelty Right Angle Drive Mechanism on display. 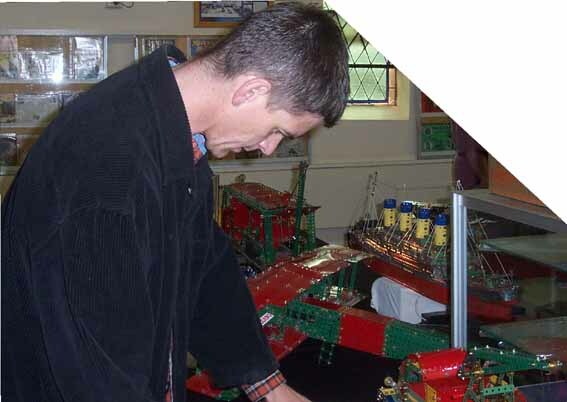 Dave Denner can usually be relied upon to produce some large and interesting model for our Exhibition, but it seems that at the moment all of his Meccano is in bits. 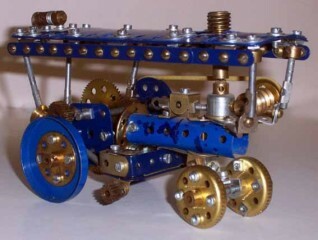 Dave has been touring Australia for several months and had to leave his Meccano at home! When he got back there was insufficient time to build a major contribution for the Exhibition. So Dave had to make do with a series of models from sets of the last 5 years or so. Just the same they made a nice display.